In this study, the effects of several stressing factors were investigated on cortisol, glucose andhaemoglobin in common carp (Cyprinus carpio Linnaeus, 1758) blood. The group of fish were kept at different water temperature ranging from 24 to 33oC and an increase in water temperature up to 27oC resulted in increases of haemoglobin and cortisol with the amount of glucose in carp's blood plasma decreasing (P 0.05). Other group of fish was subected to catching net (with keeping it out of the water included). The fish were caught with the net and taken it outof the water-each time for 50s (12-36 times during 15-45 min of the experiment time). After the practice, proved the cortisol, glucose and haemoglobin levels were a decline rates in 2-3 hours whereas the highest rates observed in 1 hour. Conditions typical for aquaculture as well as some necessary procedures applied when culturing the fish create stressing factors for the fish. In nature, when fish subjected to stressing factors is able to defend itself. Stress is defined as physical, chemical or biological factors that cause bodily reactions that may contribute to fish disease and death (Cengizler, 2000). The stress response of fish is complex and involves a series of behavioral and physiological responses considered to be compensatory and/or adaptive. It enables the fish to overcome the effects of the stressor. These responses involve all levels of animal organization recollectively called the integrated stress response (Wendelaar Bonga, 1997). Generally to evaluate the stress level in fish, stress parameters such as blood cortisol and glucose levels are used. The primary stress response of fish involves the activation of higher brain centers, resulting in the massive release of corticosteroids and catecholamines, and the activation of numerous secondary stress responses at all levels throughout the fish (Nolan et al., 2000). Cortisol, the major plasma corticosteroid in salmonid fish is secreted by the internal tissue in response to many environmental stressing factors (Idler and Truscott, 1972). Increase in plasma glucose results from catecholamine mobilizing energy resources supporting responses (Nolan et al., 2000). Common stressors are the fish catching, changes in water temperature, fish handling, stocking density, hypoxia etc. (Barton et al., 1980; Van-Raaij et al., 1996). Like other vertebrates, stressed fish exhibit a generalized stress response characterized by an increase in stress hormones and the subsequent changes the physiology, at the individual and population levels (Wendelaar Bonga, 1997; Barton, 1997). Concentrations of cortisol and glucose are among the most important stress indicators in fish. In general, the magnitude of the stress response reflects the intensity of stress experienced (Barton and Iwama, 1991). A short-term intensive stress leads to a large increase in the cortisol concentration followed by a slow decrease (Barton et al., 1980). Similar changes are typical for glucose concentration but with a certain delay (Barry et al., 1993; Carragher and Ress, 1994). The investigation was conducted at the University of the Cukurova, Faculty of Fisheries between 2002-May and 2002-November. The total length and body weight of 144 fish (72 of control once included) were measured in total. The fish were examined macroscopically in order to find out whether they showed any disease symptoms and investigated for ecto- and endoparasites (Qang, 1998; Woo, 1995; Bullock., 1989). The fish adjusted to experimental conditions in 6 ponds (1.20x0.4x0.6 m) for 1..5 months prior to experiment. At that time fish were fed daily with pelleted feed and water temperature and dissolved oxygen during the experiment was measured with WTW-oxymeter (Germany). While applying the stress factors, the experiment fish were not fed. The experiment was conducted with 72 fish and performed in three replicated. Four groups of fish, each consisting of 4 individuals, were studied. During the experiment, the water temperature and dissolved oxygen were measured for every day (Table 1). A total of 72 fish (experiment-36 and control- 36) were used and kept 4 fish each pond. The experiment were performed in three replicated. The stress consisted in catch with net of all fish from each pond and emerged out of the water for a period of 50 s during each of selected times (15, 30 and 45 min). The practice (keeping in the air for 50 s) was repeated 12 times for the first group of fish, 24 times for the second group of fish and 36 times for the third group of fish. Fish were kept in a small hanging (to reduce their movement). Blood samples of the experiment and control groups were collected after 0, 1, 1.5 and 2 h (Table 2). Blood samples were all taken within 4 min at the end of each experiment. To achieve this, all fish of the experiments were anaesthetized with fenoksiethanol (25 %) during sampling. Blood was collected by punction of the caudal vein with heparinized syringes (2 ml) and needles. According to type of analysis taken blood samples were collected tubes with EDTA and normal experiment tubes. Haemoglobin (Hb) concentration was determined by Cyanmethaemoglobin method (Blaxhall and Daisley, 1973; Tanyer, 1985), plasma samples were obtained by centrifugation (15 °C, 10 min 4000 g), the plasma separated and frozen and stored at -20 °C until the analysis. Plasma cortisol levels were determined by radioimmunoassay in samples shipped frozen in Biochemistry Laboratory of Medicine Faculty the University of Cukurova. Kits obtained from Bayer (1 vial of ACS: 180 Cortisol lite Reagent, 1 vial of ACS: 180 Cortisol Solid Phase) for assay, reagents and protocols which were described by Pankhurst and Sharples (1992); Pankhurst and Carragher (1992) were used. The glucose concentration was determined spectrophotometrically by means of Bio-Lachema Oxochrom glucose kit (Burtis and Ashwood, 1999). Results were analysed by the SPSS (Statistical Package for Science Sciences, 10.0) statistical package (Hayran and Ozdemir, 1995). Duncan Multiple Range Test was also performed in order to find effects of stressors on plasma cortisol, glucose and haemoglobin levels and particular differences among the stressor groups. Fish body weight and length was determined by One-Sample T Test. The level for accepted statistical significance was P<,>0.05. Water temperature was 24°C and dissolved oxygen in the beginning was 5.6 mg/L. The body weight and length of 144 fish used in the experiment were found as 84.87 ±1.26 g and 20.87 ±0.24 cm. The general result in fish acclimated 27°C was an initial increase in haemoglobin and cortisol followed by a decrease in glucose concentration when compared to those acclimated 30 and 33°C. Initial cortisol and haemoglobin concentrations were 23.49 ±4.30 ng/mL and 6.12 ±0.17 g/dL, respectively and increased to above in fish kept at 30 and 33°C compared with according to control fish (Figure 1, Figure 3). 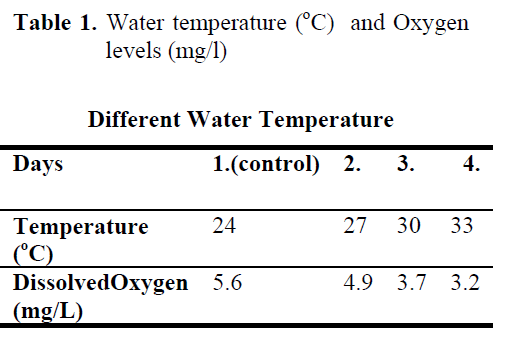 Fish acclimated to 27 and 30°C, had to initial glucose concentration of (21.46 ±3.17 mg/dL and 17.66 ±0.45 mg/dL) which were significantly lower than in 33°C (31.53 ±3.96 mg/dL) (Table 3). Finally, at the end of the all acclimated periods (3 days after) all values returned to pre-stress values. A significant increase of the plasma cortisol level was found on the first processing (15 min) of catching with net (41.34 ±5.65 ng/mL) compared with the corresponding control (17.13 ±4.38 ng/mL; within 1 hr) but was toward the low end of the 2nd h (Figure 1). The plasma cortisol in the stress treatment returned to pre-exposure values by hour 2-3. No significant differences were observed among experimental and control groups (P<,>0.05) (Figure 2). The glucose concentration in blood were showed mean peak level for 1 hr after catching with net (50 s period of keeping the fish in the air) (60.75 ±10.50 mg/dL) when compared with control fish (30.60 ±3.33 mg/dL) (Figure 2). Plasma glucose levels fall to 58.50 ±15.47 mg/dL within 2 hr but returned pre-stress levels in 3 hours. Haemoglobin levels were similar to glucose, did not vary in relation to the time among experimental groups but when compared with the control fish (5.16 ±0.20g/dL) the haemoglobin levels of experiment fish was higher (6.28 ±0.40 g/dL) (Figure 3). In response to a stressor such as handling or crowding, a fish will undergo a series of biochemical and physiological changes in an attempt to compensate for the challenge imposed upon it and, thereby cope with the stress. The stress response in fish has been broadly categorized into the primary, secondary and tertiary responses (Wedemeyer and Mcleay, 1981; Wendelaar Bonga, 1997). This initial response represents movement of system hyphtalamohyphofiser- aks (HPI) and syratetic-cromaffin (SC). Stimulating HPI system, it is seen that the value of cortisol in blood increased, stimulating SC system adrenalin value in blood increased The various biochemical and physiological effects associated with stress, and mediated to a large extent by the above stress hormones the secondary response occurs (Lowe et al., 1993). The stress hormones activate a number of metabolic pathways that result in alterations in blood chemistry and hematology (Barton and Iwama, 1991; Vijayan and Leatherland, 1980). Tertiary response represents if the fish is unable to acclimate or adapt to the stressor, whole animal changes may occur, including decreased reproductive capacity and growth (Sumpter, 1991; Svobodova et al., 1999). All of plasma samples which were obtained from non-stressed (control) and stressed (fishing with net) fish showed a rapid increase within 1 h, after experimental protocols 2nd and 3rd (within 2-3 h), cortisol and glucose values decreased in spite of increasing stress (Figure 2.). Haemoglobin values decreased in the end of 2 h but in 3 h its values also increased. These results suggest that the fishing with net procedure employed reduced the stress response as a rapid increase in plasma cortisol and glucose levels otherwise would have been expected after repeated stress (Pottinger, 1998). The plasma cortisol levels clearly show a peak within 1 h of first sampling after stress, with subsequent decreases for the following sampling times until reaching the basal levels within 24 h (Specker and Schreck, 1980). These results are in accordance with observations from our study. Similar findings were obtained by Svobodova et al (1999) and Pottinger (1998), when effects on plasma cortisol and glucose levels were observed. The fish under stress, respond to stress factor by changing its physiology, nature and hormones (cortisol, cortisone etc) (Wendelaar Bonga, 1997; Barton and Iwama, 1991). Other stress reaction being a hyperglycaemia (increasing of blood glucose) (Barton et al., 1986; Vıjayan and Leatherland, 1980). Acute stress in lots of kinds of fish, result in increasing blood metabolism causing increase of cortisol affected by the length and intensity of stress (Sumpter, 1997; Grutter and Pankhurst, 2000). Chronic artificial or stress-induced elevation in plasma cortisol suppresses the immune response of fishes. Elevated plasma corticosteroid levels result also on behavioural changes in a range of vertebrates including fish. It is clarified that to take the reply of fish to stress, the parasite values must be very high, only in this way the chronic stress can occur (Ottolenghi et al., 1999). In the end of these experiments, the reply to endocrine given depending on the stress is warning Hypotalamo-hypofiser- aks (HPI). This situation shows itself as increasing of cortisol and glucose hormones. The finding in our experiment shows this briefly. Plasma glucose levels are known to rise in teleosts after various forms of stress, including chronic and acute exposure to extreme temperatures. Both adrenaline and cortisol, well known stress hormones, are reported to cause hyperglycaemia in fish, with each hormone varying among species (Ottolenghi et al., 1999; Mazeaud et al., 1977). The changes recorded in examining of carps which were infected with parasites made immune system pressured and less functionable. So, the changes on values of plasma cortisol and glucose were caused by the changes in immune system. Cyprinus carpio, which was sampled at 27-33 °C, showed a rapid increase in plasma cortisol and haemoglobin and a decrease in glucose in response to acclimated temperature stress, with significant elevations occurring as early as 10 min after first disturbance. After experiment, cortisol values increased and glucose values decreased depend on water temperature. Temperature affects parameters in water where fish lives. So, the instant quality changes in water make stress on fish (Ottolenghi et al., 1999; Davis and Parker, 1990). In our study, it is showed stress on fish as neuroendocrin value increasing. According to the results of our experiment, the changes in water quality made neuroendocrin value increasing and made changes on plasma cortisol and haemoglobin values. Glucose values were decreasing due to the increase in water temperature (Figure 3.). It is explained why glucose value decreases in low temperature as increasing photoperiod and growing and triode hormones and also speeding up of the metabolism (Ottolenghi et al., 1999; Davis and Parker, 1990). The common carp is under a more severe physiological stress, which causes changes in some parameters, catching net (with keeping it out of the water included) and exposing to different water temperature (from 24 to 33°C). In this study, it was observed that physiological parameters could be used as effect of stressors on plasma in fish. To test these parameters after acute stress is very important to make early healing of diseases and to minimize physiological stress responses. These results suggest an increase in the maintenance requirements because of the additional resources needed to cope with stress, presumably leaving fewer resources for alternative processes such as reproduction, the immune system, growth, and replenishment of energy stores. Stress can have marked effect on the health of fishes, however more detailed experimental research on these parameters is required to provide a better understanding of the effects of acute stressors on fish unit. This research was supported by Unit of Scientific Research Projects (BAPKOM) of Çukurova University. Barry, T.P., Lapp, A.F., Kayes, T.B., Malison,J.A., (1993). Validation of microtitroplateELISA for measuring cortisol in fish and comparison of stress response of rainbow trout (Oncorhynchusmykiss) and lake trout(Salvelinusnamaycush), Aquaculture, 117: 351-363. Barton, B.A., (1997). Stress in Finfish: In: G.K. Iwama, A.D. Pickering, J.P. Sumpter, C.B. Schreck, editors, Fish Stress and Healt in Aquaculture. Cambridge University Pres. Cambridge, 34 pp. Barton, B.A., Iwama, G.K., (1991). Physiological changes in fish from stress in aquaculture with emphasis on the response and effects of corticosteroids, Annual Review of Fish Diseases, 1: 3-26. Barton, B.A., Peter, R.E., Paulencu, C.R., (1980). Plasma cortisol levels of fingerling rainbow trout (Salmogairdneri) at rest, subject to handling, confinement, transport and stocking, Canadian of Fisheries andAquatic Science, 37: 805-811. Barton, B.A., Schreck, C.B., Sigismondi, L.A., (1986). Multiple acute disturb evoke cumulative physiological stress responses in juvenile chinook salmon, Transactions of the American Fisheries Society, 115: 245-251. Blaxhall, P.C.,Daisley, K.W., (1973). Routine haematological methods for use with fish blood, Journal of Fish Biology, 5: 771- 882. Bullock, A. M., 1989. Laboratory Methods. In: Roberts R. J. and B. Tindall, editors, Fish Pathology, London, 374-402. Burtis, A.C., Ashwood, E.R., (1999). TietzTextbook of Clinical Chemistry. 3nd ed., Chapter 20, W.B. Saunders Co., Philadelphia, USA, 1100 p.
Carragher, J.E., Ress, C.M., (1994). Primaryand secondary stress responses in goldenperch (Masquariaambigua), ComparativeBiochemistry Physiology, 107A: 49-56. Cengizler., (2000). Balık Hastalıkları, Çukurova Üniversitesi Su Ürünleri Fakültesi Yayınları, Yayın No: 7, Adana. 135s. Davis, K.B., Parker, N.C., (1990). Physiologicalstress in striped bass: Effects of acclimationtemperature, Aquaculture, 91: 349-358. Grutter, A.S., Pankhurst, N.W., (2000). Theeffects of capture, handling, confinementand ectoparasite load on plasma levels ofcortisol, glucose and laktate in the coralreef fish (Hemigymnusmelapterus), Journalof Fish Biology, 57: 91-401. Hayran, M., Özdemir, O., (1995). Institute Ofmedicine physicians, statistic and computer(HYB) Medical Research issue UniMEDAR Ankara 484 p.
Idler, D.R., Truscott, B., (1972). Corticosteroidsin fish. In: D.R. Idler, editor, Steroidsin No mammalian Vertebrates, AcademiPres., 126-252, New York. Lowe, T.E., Ryder, J.M., Carragher, J.F.,Wells, R.M.G., (1993). Flesh quality insnapper (Pagrusauratus). Affected byCapture Stress, Journal of Food Science,58: 770-773. Mazeaud, M. M., Mazeaud, F. and Donaldson,E. M., (1977). Primary and secondary effectsof stress in fish: some new data with a general overview, Trans. Mer. Fish. Soc.,106: 201–212. 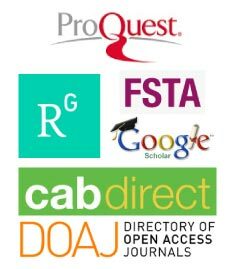 Nolan, D.T., Reilly, P., Wendelaar, BongaS.E., (2000). Infection with low numbersof sea lice (Lepeophtheirussalmonis) inducesstress-related effects in postsmoltatlantic salmon (Salmsalar), CanadianJournal of Fisheries and Aquatic Sciences,56: 947-959. Ottolenghi, C., Puviani, A.C., Ricci, D., Brighonti,L. and Morsiani, E., (1999). The effectof high temperature on blood glucoselevel in two teleost fish (Ictalurusmelasand Ictaluruspunctatus), ComparativeBiochemistry Physiology, 111A: 229-235. Pankhurst, N.W., Sharples, D.F., (1992). Effects of the capture and confinement onplasma cortisol concentrations in the snapper(Pagrusauratus), Australian Journalof Marine and Freshwater Research, 43:345-356. Pankhurst, N.W., Wells, R.M.G., Carragher, J.F., (1992). Effects of stress on plasmacortisol levels and blood viscosity in bluemaomao (Scorpisviolaceus, Hutton) amarine teleost, Comparati Biochemistryand Physiology, 101A: 335-339. Pottinger, T.G., (1998). Changes in blood cortisol, glucose and lactate in carp retained in‘anglers’ keepnets, Journal of Fish Biology, 53: 728-742. Qang, T.B., (1998). Parasitic fauna of the freshwater fish of the Cuulong River Delta(Lower Mekong River Delta) and methodsfor prevention and treatment, The AquaticAnimal Health Research Institute Newsletterarticle, 7: 1-13. Specker, J.P., Schreck, C.B., (1980). Stressresponses to transportation and fitness formarine survival in coho salmon(Oncorhynchuskisutch) smolts, Canadianof Fisheries and Aquatic Science, 37: 765-769. Sumpter, J.P., (1991). The stress response andits consequences in cultured fish, Bulletinof the Institute of Zoology, 16: 229-236. Sumpter, J.P., (1997). The endocrinology ofstress. In: G. K. Iwama, A. D. Pickering, J.P. Sumpter, C. B. Schreck, editors, FishStress and Health in Aquaculture, CambridgeUniversity Press., Cambridge, 95-118. Svobodova, Z., Kalab, P., Desek, L.,Vykusova, B., Kolarova, J., Janouskova,D., (1999). The effect of handling andtransport on the concentration of glucoseand cortisol in blood plasma of commoncarp (Cyprinuscarpio, L.), ActaVeterinariaBrno, 68: 265-274. Tanyer, G.: Hematology and Laboratory HandBook, Turkey, p. 109-148. Van-Raaij, M. T. M., Van-Den-thillart, G. E.E. J. M., Vianen, G. J., Pit, D. S. S., Balm,P. H.M., Steffens, A. B., (1996). Substratemobilization and hormonal changes inrainbow trout (Oncorhynchusmykiss,L. )and common carp (Cyprinuscarpio, L.)during deep hypoxia and subsequent recovery,Journal of Comparative Physiology,166: 443 – 452. Vijayan, M.M., Leatherland, J.F., (1980). Cortisol-induced changes in plasma glucose,protein and thyroid hormone levels andliver glycogen content of coho salmon(Oncorhynchuskisutch), Canadian Journalof Zoology, 67: 2746-2750. Wedemeyer, G., Mcleay, D.J., (1981) Methods for determining the tolerance offishes environmental stressors. In: Stresand Fish. Pickering, A.D. Pickering, editor,Academic Pres, London. WendelaarBonga, S.E., (1997). The stressresponse in fish, Physiological Reviews, 7:591-625. Woo, P. T. K., (1989). (Editor) Fish Diseasesand Disorders. Vol.1. : Protozoan andMetazoan Infections, Cab. Int, P.446.